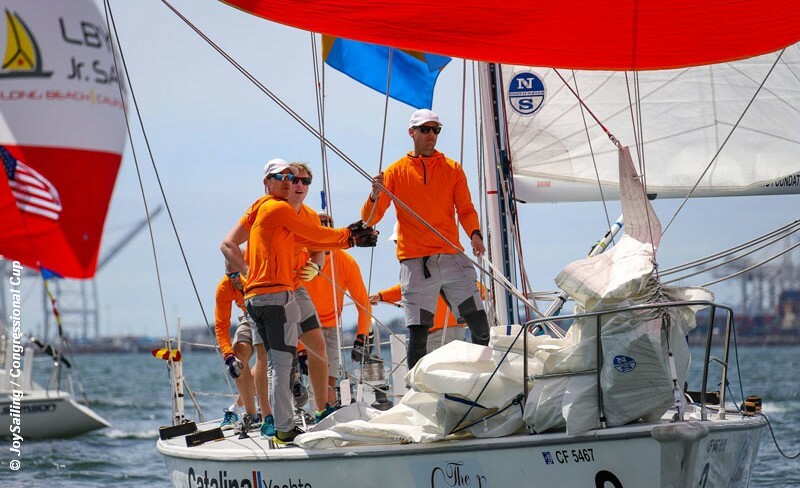 Johnie Berntsson of Sweden and his orange-clad Berntsson Sailing Team continued to dominate Congressional Cup racing at Long Beach YC, winning all but one race – which went to Britain’s Ian Williams. At the end of Day Two, with the first Round Robins complete and solid headway into round two, Berntsson was 11-1, with Taylor Canfield (USA) putting on the squeeze at 9-2. Ian Williams (GBR) and Scott Dickson (USA) each trailed by one point. Berntsson’s one loss today was to Williams, who has a history – as does Canfield – of ramping up throughout the event. Both ended Day One mid-fleet, but turned on the heat today, wrapping up at 9-3 for Canfield; with Williams and Scott Dickson (USA) tied at 8-4. Racing continues through Sunday April 7 as competitors battle through a Double Round Robin series, to advance to semi-finals and finals over the weekend.